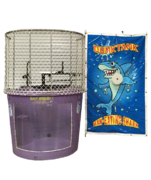 Dunk tanks are longtime classic carnival fun for school carnivals, church fundraisers, and community events. Watch your guest line up to send the victim in for the big splash! Ideal fundraising opportunity for non-profit organizations. 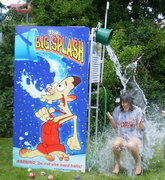 We also have the new "Big Splash Water Game". Browse the selections below and click on the image or "More Info" link for additional information and to make a reservation.